With the clock ticking down on the first half of the regular season, the University of Manitoba Bisons welcomed the Alberta Pandas to town. Heading into the game, the Bisons were riding a two-game win streak and sitting in a four-way tie for first place. UBC, Saskatchewan, Alberta, and Manitoba all started Friday night with 26 points. Manitoba split the weekend against Alberta, keeping them deadlocked for third place with the Pandas. 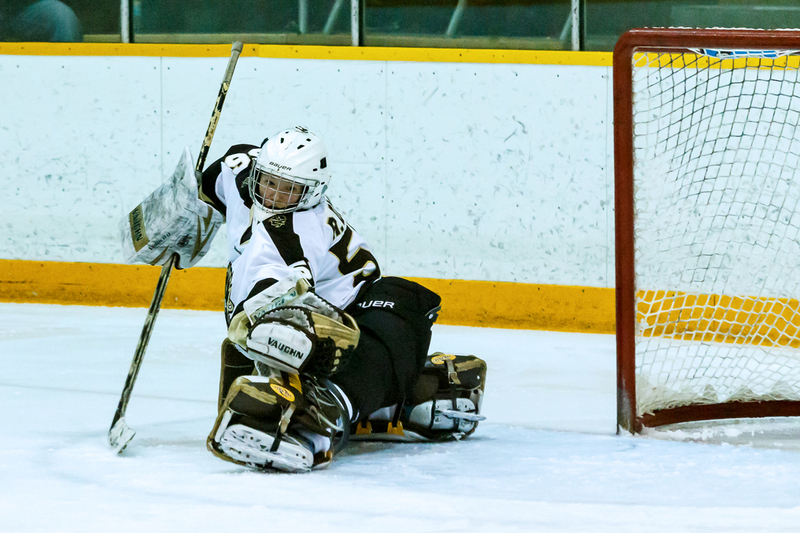 Looking to knock Alberta down the Canada West rungs, the Bisons relied on Rachel Dyck for another strong performance in net. Dyck has been having a stellar year, leading the conference with a .950 save percentage, and entered the game with a record of 8-2. Dyck has also allowed a league low of 13 goals against all season, for goalies who have played a minimum of five games. Squaring off against Dyck on the other side of the ice was Lindsey Post, who sits just below Dyck as the second best tender in Can West, with a record of 10-6. Friday night was a battle of two towers in net, with Dyck earning a shut-out and Post making 25 saves in a 1-0 loss. Dyck looked good early in the first, making a flurry of saves on the Pandas. The lone goal for the Bisons was scored by Charity Price in the second period, assisted by rookie Alanna Sharman and Lauryn Keen off a turnover by the Pandas. Sharman is also having a standout season for the Bisons, as she is now tied for second in the Canada West for points. Coach Jon Rempel wasn’t surprised by the low score of the game. The Bisons were also led by the energetic play of captain Maggie Litchfield-Medd. Saturday night did not go as well for the Bisons, as they dropped the contest 3-2. Post returned to action for the Pandas, with the Bisons opting to start Amanda Schubert. Alberta jumped out to a 2-0 lead, with goals in the first and second period. Megan Tully responded for the Bisons midway through the second, with assists from Jayden Skoleski and Nicole Carswell. Momentum was short-lived, as the Pandas found the back of the net again four minutes later. Michelle Pawluk scored late in the third with assists from Keen and Litchfield-Medd, but it was not enough to push the game into overtime. Despite the loss on Saturday night, the Bisons have dramatically improved since last season. When asked about his team’s success, Rempel was enthusiastic. “I knew that this group had potential to do some things, I’m surprised how soon they came together and the amount of good team play,” Rempel said. The Bisons now enter the winter break and will start the second half of the season in Lethbridge on Jan. 8.